* Both locks noted as "not used except for water drawing"
The last part of the Lee Navigation follows the 1¼ mile Limehouse Cut which was completed in 1770. 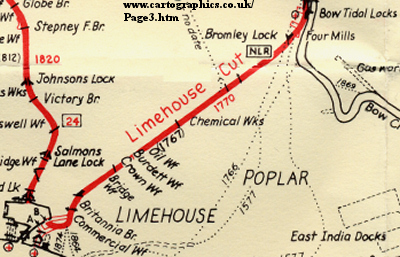 On 16.3.1772, a Minute noted “The Cutt from Bromley to Limehouse and the deepening and widening thereof…to provide passing places”. 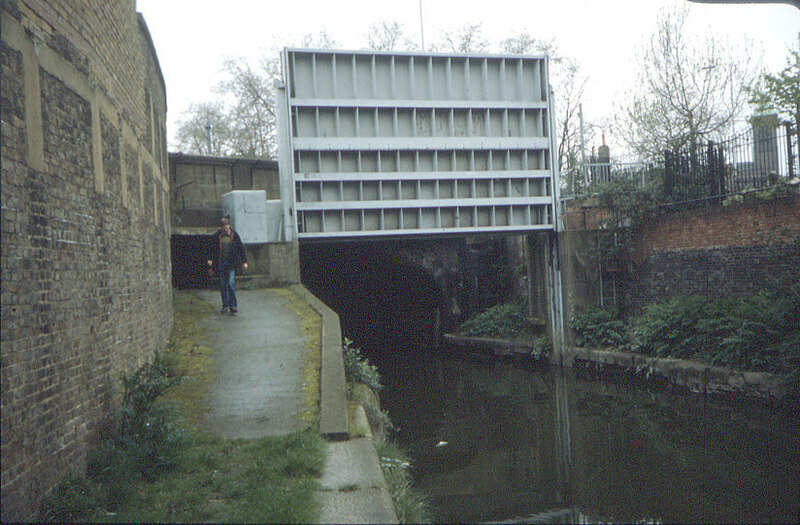 There were two locks or tide gates on the Limehouse Cut. The first was called Bromley Lock (employees shown in the Bow Locks table). 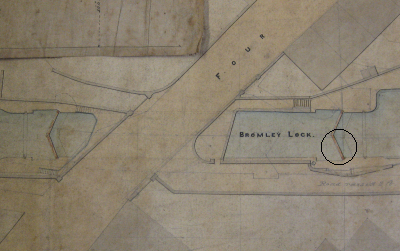 The map above was drawn some time prior to 1850 and shows the mill pool above Bromley Mills and the narrow start to Limehouse Cut with the original Bromley Lock. The plan to the left shows Bromley Lock in 1864 spanned by the bridge carrying Four Mills Street (now the much wider A102M Blackwall Tunnel Approach). The circled gate survives today. By 1899 it was reported that Bromley Lock was only used when the water was drawn down. Bromley Lock was finally removed except for one gate which can still be seen, behind the floating towpath. 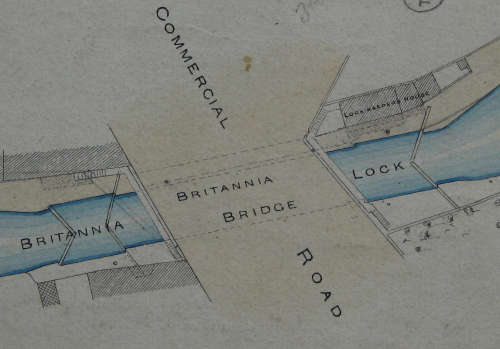 The second was next to the Commercial Road Bridge, named Britannia Lock., which was originally built in 1853 to a size of 89’ 10’’ by 20’. On 1st January 1854, the Regents Canal Co. took possession of the Limehouse Cut below Britannia Lock (and also Limehouse Lock) and opened a link directly into Limehouse Basin, bypassing Limehouse Lock. This connection only lasted ten years and was filled in between 4th and 24th May 1864. (NA Rail 845/16). Navigation resumed using the original lock to the Thames. During that period, the Regents Canal Company's Collectors (John Bigg, Richard James Larking and John Scholey) were appointed to make a return to Mr Glass "of all Barges passing between the Thames and the River Lee...at an expense not exceeding Five Pounds per annum"
In July 1870, Britannia Lock was reported not to be used except for drawing water. 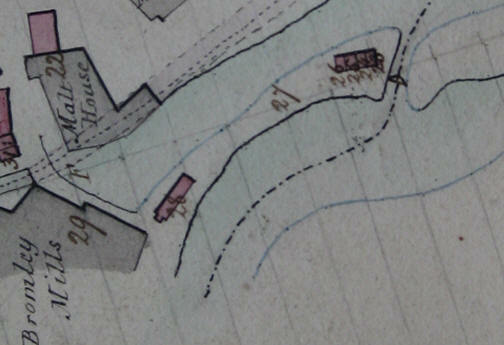 A survey of June 1880 shows the position of the lock house, the corner of Three Colt Street, the two walkways used by the lock keeper in operating the lock and the tide gates at the left hand end, referred to in the 1893 report below. 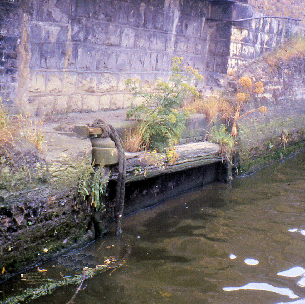 Until 2000 the levels in Limehouse Cut (and indeed, as far as Old Ford lock and around Bow Back Rivers) were affected by the high spring tides when the water overflowed Bow Locks and lifted the levels by up to 3’. Britannia Lock was replaced by a guillotine tide gate during the British Waterways years after 1948. Despite the proximity of this Lock to Limehouse, the records make distinctions as to where people worked. However, it is probable that, in actuality, the men worked where they were needed. "By the concussion on Wednesday morning last June 13th (1917), three panes of glass were broken in the (Britannia) cottage and a small crack in the house wall is reported". (LMA ACC 2423/016) This was as a result of the first daylight air raid on London, carried out by 14 Gotha bombers. 162 people were killed and 432 injured.